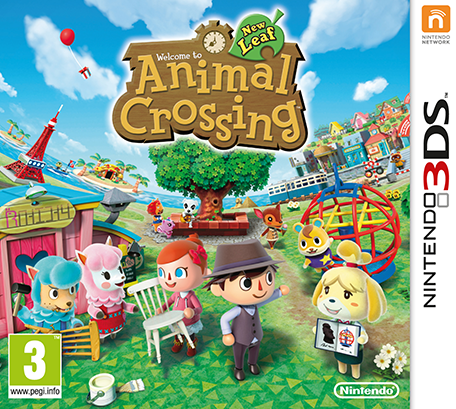 New Leaf, is this finally the Animal Crossing game fans have been waiting for? Due to my hectic lifestyle (or rather work as I call it), I tend not to play too many computer games. This is shown by the fact that I have played ZombieU for three hours since Christmas and Luigi’s Mansion 2 is still in its lovely cellophane wrapper. Recently, however, I decide I would purchase Animal Crossing: New Leaf for the 3DS (I’m not a Nintendo Fan Boy I tells ya!). Unlike the other games I have recently got, I felt Animal Crossing was more pick up and play as well as being the sort of game you could leave for a week then easily come back to. I wasn’t expecting too much as the previous Animal Crossing games have been rather samey with just a few extra features. They have felt like upgrades rather than new games. Right, so I am now designing a t-shirt with sleeves as well as a body section and have a cafe under the museum. Hardly worth forking out another thirty quid for. Safe to say I went into this one not expecting much, but three days in and I am loving it. And it is all down to one simple fact. They have locked down a lot in the game. You still have all the stuff from before, but now you need to earn it. The cafe, Shampoodles, upgrading Nook’s store, the Happy Room Academy. All these are unlocked as you accomplish different goals, giving the game an achievement feeling rather than an aimless wandering vibe. Further to this, the idea of being mayor adds a new dimension, not that it is much more than deciding on what projects to build. The great thing is that what you want to build is again based on how far you have got and even better is the fact you need to care for your town or you will get bad approval ratings which means you cannot start building any projects in the first place. Rather than getting annoyed with the citizen for asking you to help only to get a poor t-shirt you would never have bought from the shop in return or pulling up endless weeds for no apparent reason, you know now that with every weed and every successfully aided citizen your approval rating goes up and so does the ability to make your town your own. There is also this strange thing about the game, unlike something like Pokemon that frustrates me every time I start a new iteration and play pretty much the same game again, Animal Crossing feels like a new beginning and I happily catch the same bugs and fish I have in previous versions. Nintendo have also added some little features such as having bottoms as well as tops to your clothes and being able to customise the outside of your house. Another annoyance they have ironed out from Let’s Go To The City is the time it takes to get to the shops. Endless boring loading screens and Cap’n’s tedious stories disappear, instead it is just a quick jaunt over some train tracks (there are no safety warnings about level crossings though….tut tut Nintendo!). Another feature I am guessing will come in later on is the Nook’s shop upgrading. This used to leave me frustrated as you had to wait a day before you could sell anything. But now we have Re-tail instead of the recycling point in the main area of the town which I guess means I can still sell my stuff there. So far the new version is the first that feels like a new game and I am yet to discover the diving suit, re-emergence of the tropical island or how street pass mode works. For once I am wanting to play a computer game when I get home rather than write, read a book or watch a film. I really hope the enjoyment continues and there are lots more surprises in store, for instance the catalog at Nook’s store is not there so I am hoping that appears when/if the shop upgrades. Now all they need is to place in the update I have always wanted, getting a sports stadium and being able to play one-off games and tournaments against other towns. They could have something like three on three games and you select the villagers you want on your team. If they set aside a whole day when each game was on you could play anytime on that day but also have specific online tournaments at certain times. You could even buy upgrades to play more sports i.e. you choose to start with football then when you upgrade you get swimming, next upgrade you choose baseball and so on and so forth. Actually you might want to scratch that one as I will probably end up getting addicted and start thinking I am hedgehog and talking in little beeps! Surely he won’t go there?